Great apartment with stunning views, set in well maintained grounds, lovely big pool and pool bar to relax in. Apartment is well maintained and secure. Beds were comfy too! Perfect for our family of 4 (1 baby and 8 yr old) . Alan and Dora were on hand to handle the booking and check-in with complete peace of mind. Having stayed in Calahonda many times, I would definitely recommend this apartment. 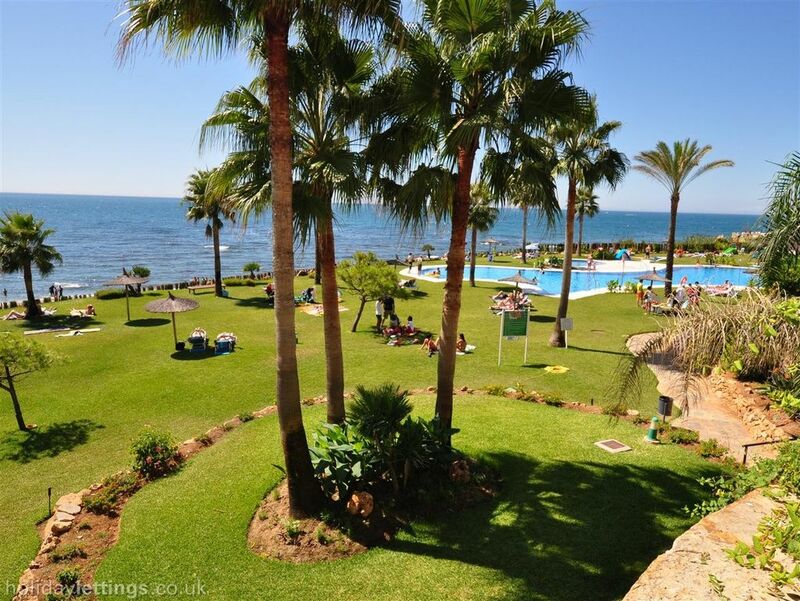 3rd time staying at this apartment in Mi Capricho - we love the complex, lovely gardens, fab pool, great location for restaurants, supermarket, walking to cabopino, or other direction to La Cala. Service for arrival and departure excellent, including arranging taxi to and from airport. Only thing that would make it better, the apartment itself could do with a freshen up/some refurbishment. Stunning 3 bedroomed ground floor apartment with a view you to die for. My husband and I , 2 teenage boys and elderly parents have just had the most amazing 2 weeks here. If you like having things to do but hate being jammed in like sardines on sunbeds or overcrowded this is definately the place to go. We went in the school holidays always a busy time but it never felt crowded with loads of space in the beautiful and spotless grounds. This apartment is well maintained and equipped with everything you could need and in a prime location. Just steps away from our garden complete with loungers was the fantastic pool area , pool bar, boardwalk and sea. The view was to die for uninterrupted bliss and we never tired of it watching the boats sail past. Heaven. There are a couple of lovely restaurants very close on the boardwalk and some excellent take away restaurants nearby which we used several times so we could sit on the terrace and watch the world go by as a family. We didn't have a car and didn't find it a problem as an excellent cheap bus service stops right outside the apartment that we used for any trips further afield we fancied. We used the bus service and train service easily to visit Marbella, Fuengorola , Cala de Mijas and even Gibraltar and Mijas in the mountains . My parents who are elderly also used this with relative ease and it was nice not having to drive as we drive so much at home with our jobs. A huge supermarket again close and more bars and restaurants if you needed them was over a footbridge over the main road . Alan the owner was excellent to deal with, trust worthy always a bonus and always happy to answer any questions we e mailed him about. Would highly recommend this apartment to anyone wanting a peaceful and relaxing time. Nice clean apartment with all the tings you need. Quiet place and great pool and playground for kids. Beach and a big supermarket nearby. Lovely clean apartment beautifully placed on the complex. Welcomed on arrival by Dora with beach towels in hand. We had also asked for travel cot and high chair for our grandson which were already there and in excellent condition, much appreciated. Everything we needed and more including hair straighteners and parasol /base. We have stayed in this area many times before as we know it so well, but this was our favourite! Alan made booking it a joy , with updates by email with no hassles. We visited the aqua park with whole family(just a bus ride away), ate at the picturesque Valparaiso restaurant (still as good as 25years ago) and walked to the many bars/restaurants along the boardwalk. In all this was an amazing 2week holiday ,we will certainly be back next year!! LONG TERM RATES Email acrean@gmail.com directly for additional details. November to March:	Special rates over the winter months for bookings of four weeks or more - 4wks+ Starting at €400 per week Additional discount for longer periods Check-in: 16:00 Check-out: 10:00 Arrival/Departure arrangements There will be a surcharge of €50.00 for arrivals and departures between 9.00pm and 8am to be paid directly to the management company. Comprehensive directions from the airport and additional contact details for the management company will be emailed to you approximately 1 weeks before your arrival date.